It seems fitting to start off this month’s eBay round-up by talking about the one eBay-related story that gained the attention of the press. 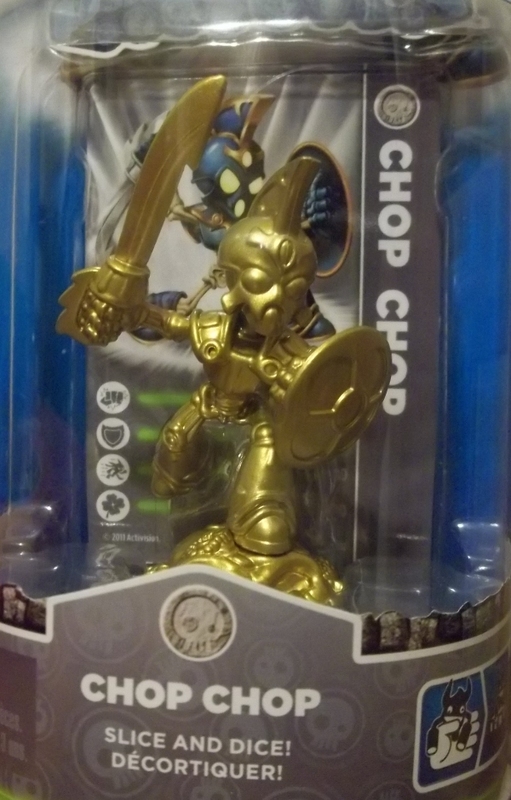 A set of rare silver and gold Skylanders figures ended at a colossal $1,263 (£797) on 18th February. That’s on top of the £30 delivery charge the buyer faced. Another set with two silver figures also fetched an absurd amount – £399. The most a single figure has sold for, as far as we can see by eBay’s recent completed listings, is this glitter-covered Dark Cynder which sold for £189. It was only available to those who attended Toy Fair 2012. What could be worth more than a set of shiny action figures? How about the most unlikely thing of all – a Mega Drive football game. A rare blue box version of World Championship Soccer 2 sold for £808 (21 bids). The re-release version, which came in a box made to look like it was covered in brown paper, is virtually worthless. This Bubsy the Bobcat promo set must almost certainly be one of a kind. For £230 the buyer received an early version of Bubsy II on an EPROM cart, a demo version of Bubsy II on another cart, a badge and postcard and a launch party invite from 1993 printed on a foam flip-flop. A flip-flop. Not only are we no curious as to what it smells like, but also to what Channel 5 smells like. Australian soaps and Spice Girls, probably. Here’s another auction that had us rubbing our eyes: a factory sealed copy of Zelda: Link’s Awakening that went for £2,050 (25 bids). A sealed Wario Land also went for £797 (20 bids) and a copy of Battletoads for £375 (14 bids). Nobody, however, wanted five sealed copies of Final Fantasy I & II for £160. Did you know there were plans for a Battletoads cartoon? Judging by the quality of animation in the pilot, the fact it wasn’t made into a full series was probably for the best. A new and unused Master System II went for £99.99 (2 bids) while a copy of Power Strike 2 sold for a little more – £120. It has been said that the price of SNES stuff has shot up in the past year. Completed auctions ring true here – a copy of Cool World went for £670 (29 bids), Daze Before Christmas for £607 (30 bids), Mega Man X2 for £575 (21 bids) and Aero the Acrobat 2 for £330 (9 bids). An American auction for a Blockbusters’ Donkey Kong Country competition cart also sold for $899.99 (£567) on a Buy It Now. Searching for PSP stuff that’s sold for high amounts becomes a whole lot harder this month due to the costly PS Vita being released. We’ve found a few bits though – a Core Crisis limited edition bundle that went for £300 (1 bid), a Japanese Dissidia 012 Duodecim console that sold for £215 and a development system that fetched $299 (£189). An unreleased prototype of Aliens vs Predator on Lynx sold for £215 (5 bids). It’s a first person shooter that would have been released around the same time as AvP on the Jaguar. Atari hoped that it would be a much needed system seller for the Lynx. If they had actually thought to release it, it may have been.